System Requirements : Pentium or Athlon 300mhz or higher. 64MB RAM, 8MB 3D accelerator, 400MB Hard Drive space, Win9x. Reviewer's machine : AMD Athlon 1.33ghz, 384MB RAM, Elsa GeForce3 64MB, SB Live, Win98. The future is interpreted in many predictable and sometimes unusual ways. Sometimes it's a lush utopian society, and sometimes its a bleak, lonely world. In Ion Storm's Unreal engine driven 3D action/RPG game, Deus Ex, its a little bit of both. While it's probably not the setting people expected (most people expect a violent, dog eat dog world), it's a welcome change. 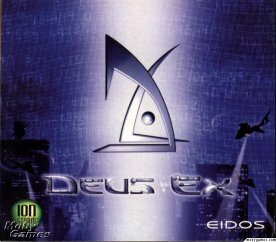 Deus Ex takes place in the late future (around 2050 or so) and the world is a technology-laden society. You fill the shoes of J.C Denton, a cybernetically enhanced UNATCO agent (like in System Shock 2) and charged with the duties of keeping the New York free of crime. You later find out that there is something bigger than crime out there, something that will affect the whole world in a big way, and no it's not a monster. Those are the main points of the story, and I won't give away anymore, now onto the game features! The game plays nothing like your regular RPGs. You do not level up by killing other soldiers or monsters. Instead, you find these little things called "Augmentation Canisters" which you can use to upgrade your gizmos, such as: flashlight, drone, etc. You can also find items that will upgrade your skill points, such as: Heavy Weapons skill, speed, etc. Like in most RPGs, you have an inventory you can customize. You can't carry every single weapon you find out there. You have a limited amount of space in which you can carry items, and not just weapons I might add. Of course battling the minions of evil is just like any First Person Shooter out there, just shoot and kill. But since this game is an RPG, you sometimes have to TALK first and then SHOOT later. The game has a variety of scenarios and areas which will keep you busy for hours. The game offers over 12 weapons from batons to plasma cannons and also a variety of useful items like lock picks and hacking equipment. This game utilizes the stunning Unreal engine, and if you've played Unreal and thought it was good, this will blow your socks off. The textures and detail are just amazing. The game supports 32Bit color using D3D, Glide, and I believe OpenGL Support. As for sound, it supports EAX and even without it, its still amazing. The game also offers speech spoken by the characters in the game which is very convincing and entertaining.